It has been a long journey for several of Middle-earth's greatest heroes. After racing across the seas, battling Corsairs, fending off sea-monsters, foraging through island jungles, and finally navigating the underwater passages of a hidden temple, they sail for Dol Amroth. But once there, instead of peace, they find war. The Corsair fleet has attacked! 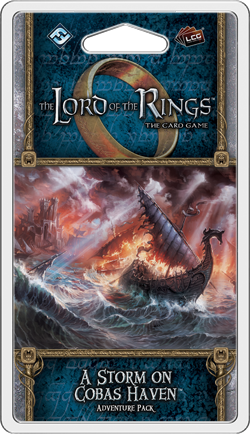 Fantasy Flight Games is proud to announce the upcoming release of A Storm on Cobas Haven, the fifth Adventure Pack in the Dream-chaser cycle for The Lord of the Rings: The Card Game! 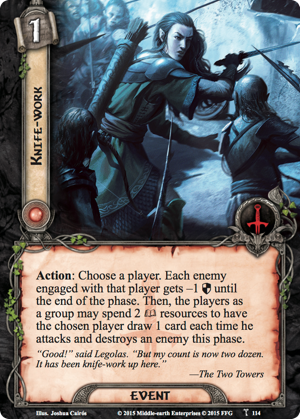 In the penultimate chapter of the Dream-chaser cycle, Middle-earth's heroes must lend their strength to the defense of Dol Amroth and its fleet. It's a nautical battle like no other as your heroes have to demonstrate their newfound mastery of the Sailing test as well as their prowess in ship-to-ship combat. Fortunately, as you fight your way through the Corsair fleet, you'll gain the aid of Dol Amroth, as well as that of a talented new Tactics hero. Additionally, you'll find thirty new player cards (three copies each of ten different cards), many of which reinforce the Dream-chaser cycle's focus on powerful allies and secondary effects that can be paid for by the group as a whole. After spending their last several adventures regaining their land legs, in A Storm on Cobas Haven, your heroes will once more need to head to sea, keep their Ship on course, and deal with deadly Corsair Ship enemies. The Adventure Pack's scenario features three quest stages. Make it to the final quest stage, and your heroes will engage the Raiders' flagship in order to defeat it and rout their fleet. Until then, however, you'll need to focus as much on your Sailing as you do on the enemies that surround you. 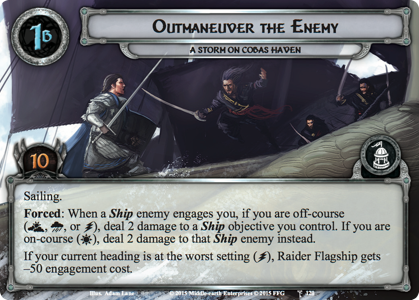 Like Outmaneuver the Enemy (A Storm on Cobas Haven, 120), both of the first two quest stages feature Sailing tests with significant consequences. Sail successfully to Outmaneuver the Enemy, and you'll get some free damage against enemy ships. Fail, though, and you'll find your ship taking hits, and maybe even taking on water. Of course, wherever you have Corsairs and Ships, you have boarding parties. And even as your heroes will need to find some way to deal with the dozens of Corsair ships charging through the waters, they'll need to deal with a full assortment of ferocious Corsair enemies from the Corsair deck. It's enough to sink the spirits of lesser men and women, but your heroes know the fate of Dol Amroth relies upon their efforts. 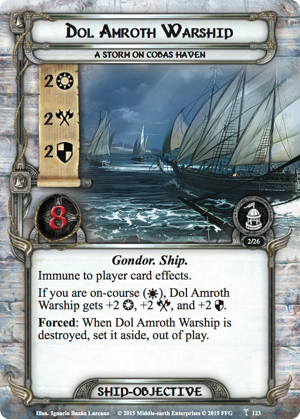 Accordingly, even if it looks like a losing fight, they'll keep going, and they'll hope that the rest of Dol Amroth's fleet will be able to rally behind them. Throughout A Storm on Cobas Haven, you'll have the chance to rally the forces of Dol Amroth by clearing out and taking control of any of four different Dol Amroth objectives. 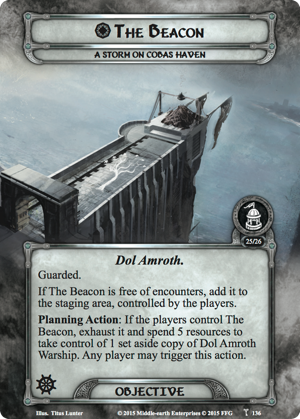 Like The Beacon (A Storm on Cobas Haven, 136), each of these can then strengthen your position, whether by allowing you to add copies of the Dol Amroth Warship (A Storm on Cobas Haven, 123) to your fleet, by damaging enemy Ships, reducing the Archery total, or improving your chances of Sailing successfully each round. 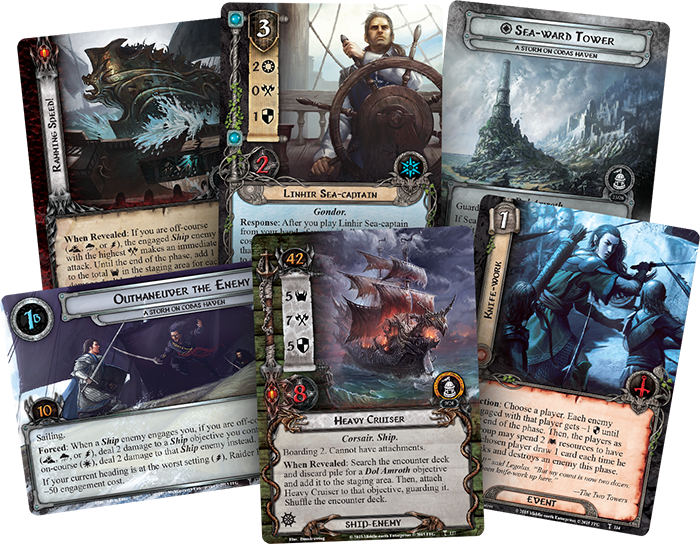 To help your heroes survive its ferocious naval warfare, A Storm on Cobas Haven arms them with an assortment of ten different player cards, a good portion of which focus on combat and healing. Several, like Knife-work (A Storm on Cobas Haven, 114) and Ioreth (A Storm on Cobas Haven, 117), also reinforce the Dream-chaser cycle's focus on effects that the group, as a whole, can pay to trigger. But even at that moment, you may be able to claim victory via a desperate gambit. 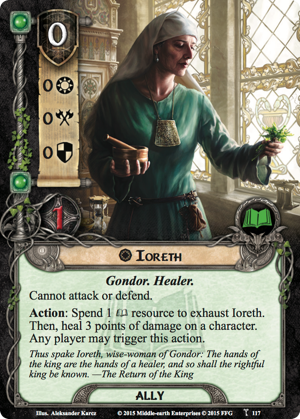 Among its player cards, A Storm on Cobas Haven introduces an event with an effect that is entirely unique among all the other cards in The Lord of the Rings: The Card Game. 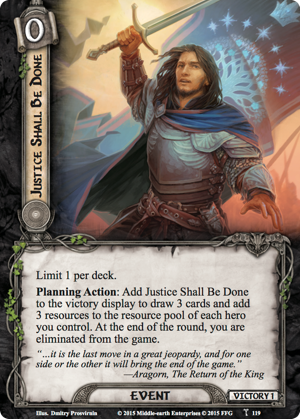 Justice Shall Be Done (A Storm on Cobas Haven, 119) is a Planning Action that eliminates you from the game at the end of the round, but a lot can happen in a single round. And before Justice Shall Be Done eliminates you, it gives you the card draw, the resources, and the opportunity to turn the tide of battle back in your favor. Obviously, there's limited use for this card in solo play. While you're playing by yourself, you need to have the end in sight in order to benefit from this card; otherwise, it's merely a chance to take vengeance on the scenario that's already beating you down. In multiplayer, however, Justice Shall Be Done may allow you and your heroes to mount the sort of final stand that can buy the rest of your table the time it needs to find victory. Think, for example, of Gandalf's confrontation with the Balrog. When the entire group is confronted by the threat of defeat, Justice Shall Be Done may allow you to engage and defeat a host of enemies, or clear out several locations, or place enough progress on a quest stage for the rest of the group to focus its efforts toward the final victory conditions. And even if your play of Justice Shall Be Done doesn't lead to the group's ultimate success, it may allow you to perish in such fashion as to be worthy of a song! The black sails of the Corsair fleet are massing on the horizon, and the bells are ringing in alarm. The salty sea breeze ripples through your hair. A battle is coming! A Storm on Cobas Haven is scheduled to arrive at retailers in the third quarter of 2016!